Since this is a component with multiple platforms the structure is a bit different than single conponents/platforms. So there should not be any circadian_lighting.py files in the root of the custom_components dir. Thanks a lot ! It seems to be working fine now :). Hey all, I know I need to update the instructions for the new file structure. I’ve been holding out because I want to either get CL working with custom updater or I want to get it integrated as a native HA component. My big hangup for getting it integrated natively is that I want to add functionality to enable/disable colortemp and brightness on the fly for each CL switch. Ideally the front-end would have a button to toggle colortemp and a button to toggle brightness for each CL switch entity, either on the entity row or in the more-info panel. Problem is, there’s no existing front-end component with this functionality. I reached out in Discord, but I got the impression that there wasn’t much interest for me to add a special entity row or card for CL so I’m not sure if a PR would be accepted. So at this point I’m trying to decide if I should keep pushing to get answers for native integration, or if that’s a waste of time and I should just move forward with getting CL working with custom updater and build a custom entity-row that people could manually add to Lovelace if they’re so inclined. Did you look at this: Lovelace: Button card ? The problem is convincing the front-end devs that something like that should be accepted as an official entity row. I have two lights controlled by circadian_lighting. However I only want one light to have disable_brightness_adjust: true. Is this possible? I tried adding a second circadian_lighting platform switch but seems HA only uses the first one. EDIT: in order to get this working, you must define a unique name for each switch. I have two lights controlled by circadian_lighting . However I only want one light to have disable_brightness_adjust: true . Is this possible? I tried adding a second circadian_lighting platform but seems HA only uses the first one. You have to set up a second switch, not a second platform. Hi, thanks for a truly great plugin! I have a really strange issue though. I have a lot of automations using node-red and I have found that when I have an automation that sets a specific brightness to a light when turned on, the circadian lighting plugin cannot budge it. However the brightness indicator in the interface says that the brightness is as expected (255 for example). To take an example. I have a motion sensor in my bathroom that turns on the light to brightness 100 if the state of the bathroom light was off. Simple. However, in this case I would expect that circadian lighting would take over and dim the light to the appropriate lighting level (255 for the middle of the day). BUT this does not happen. The interface is updated to say that the light is at 255 brightness, but the light itself is not changed. And if I use the dimmer in home assistant, to change the brightness to like 99%, the lights very briefly brighten before being returned to the start. The reason why I believe this to be a bug in your component and not in Home assistant is that no other thing behaves this way. This exact automation has been running in combination with dimmers etc without issue, and there has been no issue with the interface not showing the actual dimmed value. If I change my automation to NOT specifically append brightness when turning on the light, everything behaves as expected. and also, strangely if I dim using my wall dimmer it also starts working (i.e. dimming while the light is on). This only seems to be an issue when the light is started with a set brightness. This is an issue with all my automations that set the brightness this way, not just this specific one, but it was the easiest to explain. I really would like this to work with a set brightness, since I would like to default to a low brightness to avoid blinding someone in the middle of the night if the previous brightness was high on a lamp that is not used often. My home assistant version is 0.84.5, and I know it’s not the latest, but I really need to prepare before updating to the lovelace ui, as I’ve heard that many people are having issues with their old config. Again, thank you so much for this component, it is really striking, but this issue is driving me mad, and I truly hope you have some insight into what could be the issue! Have you tried turning on debug logging for Circadian Lighting, and if so, is the behavior different between when you do and do not set brightness in Node-RED? Also, to confirm, you want Node-RED to turn the lights on at 100, then CL to adjust them immediately? Thank you for your swift response. Unfortunately after enabling debug mode I can no longer replicate the issue. I’ll have to try again tomorrow, perhaps this is just an issue during the day (when the light levels are > 250) or something. I’ll try to check before work tomorrow, but worst case I work from home on friday. Yes that is correct! 100 is just an arbitrary number, so it’s probably lower (like 1) at least for some lights. Upon further research I realised that my error description was entirely wrong. 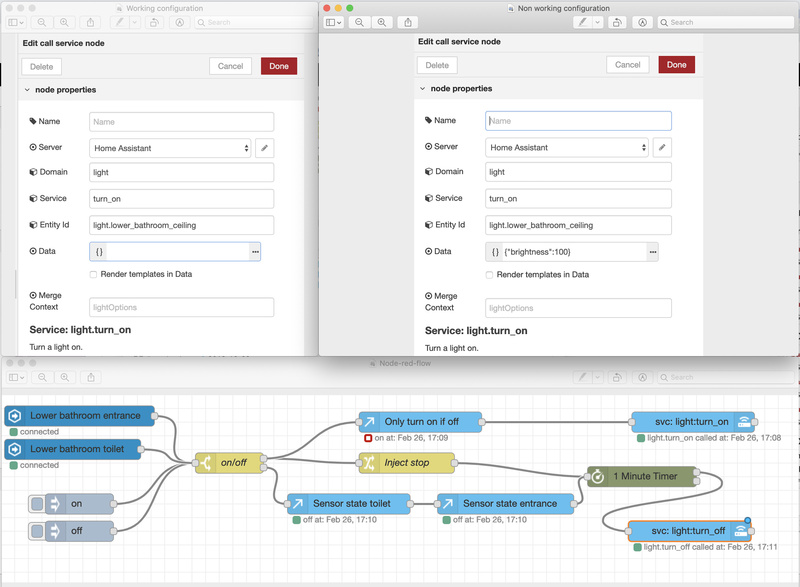 I am using the Deconz-integration in home assistant to control my trådfri-lights. The only thing I can think of is maybe Deconz doesn’t like non-integer brightness - the front end thinks the light changed due to the service call, but the light never actually adjusts. Try the above and let me know the result. Works brilliantly! Is a “dual step” something that could be a mode or something? I really don’t know how to track this issue further to the source! Thanks for your help in troubleshooting this! If you have any idéas in how to implement a “trådfri compatible” fade, that would be much appreciated and would make my setup work a lot better, but as for now it at least kind of works . I’m glad you got to the root of the problem! Certainly there are many possible options to fix this, but from the CL side of things it would basically require looping say 100 times with no transition and changing brightness 1/100th each time. While possible, there are some big drawbacks to this approach. CL can only control things through the standard hass.services.call. Every time that happens there are multiple things occurring, including: writing events to the event buss, updating states to the db, and potentially triggering other automations, etc. So if CL implemented such a workaround all that would happen times 100 for each light that’s adjusted. The real solution, ultimately, needs to be implemented in the component that actually registers the entity (in this case Deconz).